In January 2016, the Takoma Park, MD, City Council began its annual retreat much like it had traditionally done: a check in on the status of major projects, an overview on the financial standing of the City, and a discussion about priorities for the upcoming year. New to the agenda, however, was a facilitated discussion from an expert on the subject of racial equity. While the Council already had a good general understanding of what is meant when we refer to racial equity, they dug much deeper at the retreat, discussing how racism is ingrained and institutionalized in government policies and practices, even those often believed to be race neutral. By the conclusion of their discussion, the Council had made the decision to make unpacking and addressing racial equity an enduring priority for the City. So what did they do? The first step was to direct staff to begin including a “Racial Equity Impact Statement” on every agenda item – voting items, work sessions, public hearings, etc. – that goes before Council for consideration. While Takoma Park is very diverse, there are concentrations of people of various racial backgrounds in particular parts of the City. The new impact statement, which accompanies the fiscal and environmental impact statements that have long been included in agenda items, forces decision-makers to consider potential implications of policy and budget decisions on racial equity. For example, they now must consider who benefits and who is harmed when making decisions about whether to proceed with major project in a certain area. When discussing whether to approve certain requests – like new sidewalks, traffic-calming, or parking permit areas – they now must be thoughtful about the systems in place for making such requests and determine where the City should be more proactive rather than reactive in addressing them. In addition to the Racial Equity Impact Statements, the Council has been discussing racial equity as a new priority at just about every opportunity. The Mayor and a Councilmember drafted a blog that includes links to important resources for those interested in learning more. The Council formally adopted a Resolution “Committing the City Council to Systematically and Deliberately Apply a Racial Equity Lens in Decision-Making.” Very importantly, the City became members of GARE and had its Councilmembers along with 15 senior staff attend a day-long training hosted by GARE on racial equity. 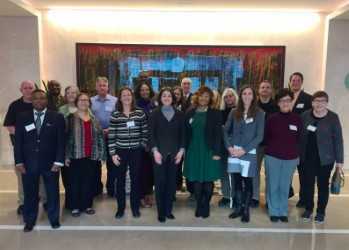 Although it has only been a few months, we are already seeing the value in our membership, as we have regular opportunities to ask questions of experts on the subject of racial equity and engage in discussions with other government practitioners from across the country who are working to address racial equity in their own communities. Moving forward, the Council has developed new language in its 2018 priorities that will take the City’s efforts to the next level. Over the course of the new Council’s term, they plan to develop a strategic plan to racial equity issues, including how we organize, institutionalize, and operationalize the racial equity framework; develop a task force on racial equity; conduct a racial equity survey of City staff; and offer racial equity training to members of Council-appointed committees and other residents. We fully expect that the road ahead will be long and not without its challenges, but we are hopeful and optimistic that we can work in a meaningful way to recognize and right some of the institutional wrongs in our community and serve as an example for others.